You'll be £12.00 closer to your next £10.00 credit when you purchase Churchill Tanks. What's this? Designed as a heavily armoured tank which could accompany infantry formations, the Churchill's ability to cross rough ground and climb seemingly unassailable hills became legendary. The tank first saw action in 1942 and the basic design was constantly re-worked and upgunned, culminating in the Mark VII version which was capable of taking on the heaviest German tanks. In his fourth book in the TankCraft series, Dennis Oliver uses archive photographs and thoroughly researched, vividly presented colour profiles to tell the story of these iconic British tanks. 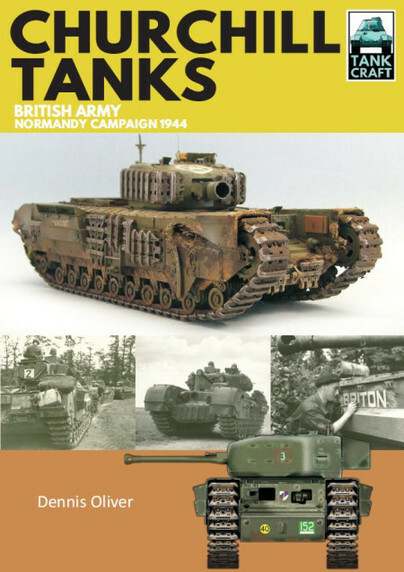 As readers have come to expect from the TankCraft series, the large full colour section of this book features available model kits and accessories as well as aftermarket products. In addition to the colour profiles there is a gallery of expertly constructed and painted models. A separate section explains technical details and production modifications giving the modeller all the information and knowledge required to recreate an authentic reproduction of one of the tanks that contributed so much to the British effort in the battles for Normandy. Modellers should find many an interesting scene to depict within its pages and information on how to get the resources to model one. I have been waiting for a title devoted to the Churchill from Dennis for a long time and this one did not disappoint. Very much worth the long wait. Highly recommended as are the other titles in this series. First-class documentation that will delight car modellers, historians and military investigators. Having read many of the authors other books he has continued to fit tons of information into this title as his others that the armour enthusiast and model builder will greatly appreciate. Archival black-and-white photographs and vivid color images complement the author’s painstakingly researched text covering everything from unit histories to technical analysis. This book about an iconic tank that contributed so much to the victorious British campaign in Normandy and beyond should be of great interest to history buffs and an inspirational aid to modelers. Another excellent publication from Pen And Sword’s Tank Craft series arrived for me before Christmas and it has taken me a while to sit down properly and give it my full attention. The Churchill tank is another iconic armoured vehicle from World War Two. Its unique boxy shape and tracks make it one of the more unusual looking tanks from the war. It was also developed into various different engineering models, including a bridge layer and flamethrower version. Dennis Oliver covers every aspect of the Churchill in great detail and this is a good book for anyone with a historical, modelling or wargaming interest in the tank. He goes through the use of the vehicle in all of its units at the back end of the war. I particularly like the details on individual tank names that were used and that’s something I plan to adopt when i am building my next Churchills. The historical details are accompanied by numerous excellent illustrations and photographs, more great inspiration for whatever you want to do. There is also a comprehensive guide to the various choices modellers have to build their own Churchill kit in most scales. This is aimed more at 1/35 scale modellers but inspiring none the less for everyone. There are more great pictures of completed kits by highly skilful modellers. I love reading about and looking at tanks, so if you are like me you will like this book! Excerpt from book as featured in. In summary. Any model maker building a Churchill looking for inspiration needs to look no further. This book is a great combination of information about the units that operated the tank with a great collection of superbly built models. There is a wealth of photographs of the Churchill in action and the colour plates are worth the cover price alone. Dennis Oliver’s text is informative yet easy to read. Highly recommended to model makers and historians interested in Allied AFVS in Normandy. Many thanks to Pen and Sword for the review book. For the modeller or the wargamer, this is a worthwhile addition to the bookshelf. Colour details are excellent and accurate as are the marking details. A great book if you are a model maker, and worth checking out even if you prefer the the real thing. The Tank Craft series has become very popular with modellers and enthusiasts. This new addition to the range meets the criteria of excellent photographs and drawings with descriptive text and full captions – Very Highly Recommended. A brilliant, comprehensive and very-well illustrated look at the Churchill Tank. If I may borrow a phrase from the late Sir Bruce Forsyth, 'this is my favourite'. Good value for money for the Churchill tank modeller, well done Dennis.